The two sides "agreed at the meeting to hold a South-North summit in Pyongyang in September as planned", Yonhap quoted a joint statement as saying, without giving a precise date. 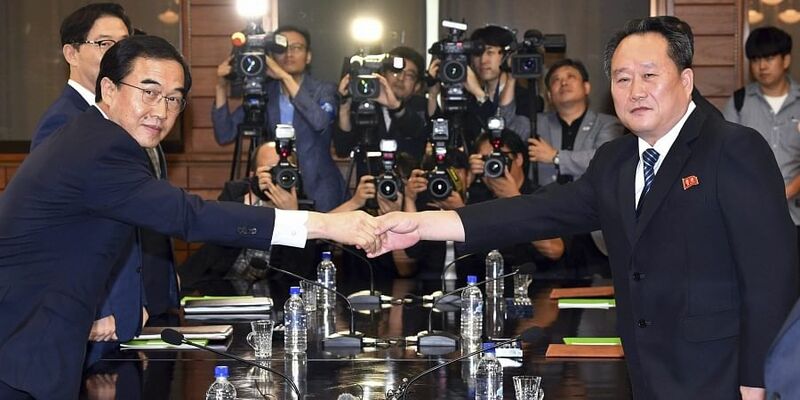 SEOUL: North and South Korea agreed today to hold a summit in Pyongyang in September, the South's Yonhap news agency reported following high-level talks in the Demilitarized Zone that divides the peninsula. A trip by the South's President Moon Jae-in to the North's capital would be the first such visit for more than a decade, as the diplomatic thaw on the peninsula builds. Today's high-level talks, taking place on the northern side of the truce village in the Demilitarized Zone, were proposed by the North last week as it lashed out at Washington for pushing ahead with sanctions. In his opening statement, the North's chief delegate Ri Son Gwon said: "As the Pyongyang meeting of the leaders of the north and south is being discussed, I think talking about the issue will provide answers to the wishes of the people.
" Using a proverb describing a very intimate friend to refer to inter-Korean ties, Ri added: "We have opened an era where we are advancing hand in hand rather than standing in each other's way.
" Despite the rapprochement, international sanctions against the North for its nuclear and missile programmes have kept economic cooperation between the two Koreas from taking off, while little progress has been made on the key issue of Pyongyang's denuclearisation. South Korea's Unification Minister Cho Myoung-gyon, leading the delegation from Seoul, said it was important that the two Koreas keep "the same mind". "Many issues will be raised (at the meeting), but I think any problem can be resolved with that mindset," Cho added. Cho addressed the possibility of Pyongyang raising the issue of sanctions to the South, and said: "We will explain our position to the North.
" The rapid rapprochement between the two neighbours that began this year paved the way for a landmark meeting between Kim and US President Donald Trump in Singapore in June. But Harry Harris, the US ambassador to South Korea, said Monday it was "too early" for such a declaration, Yonhap reported.